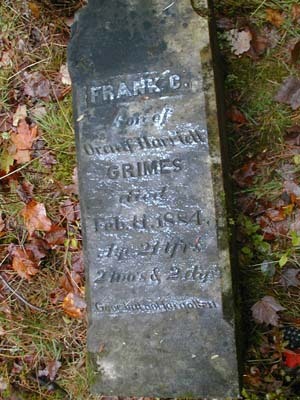 DIRECTIONS: This single grave is located on the Studley Hill Road, directly across the gate for Hoose Cemetery. 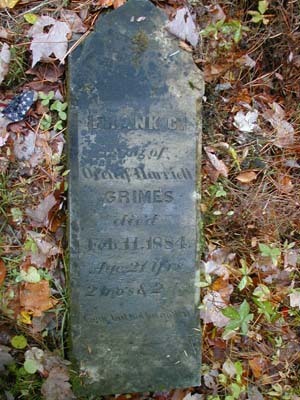 I would like to thank Dana Pearsall for taking the time to show me this gravestone. While there, we rolled the stone to make certain there was no writing on any of the other sides. Approximately 100 yards away, lies the foundation of the old Grimes homestead. 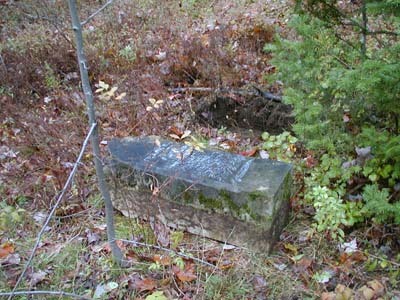 This stone was transcribed and photographed 20 October 2002 by Joyce M. Ranieri. Seaver's Historical Sketches of Franklin County and Its Several Towns With Many Biographies, N.Y., Albany: J. B. Lyon Company, ©1918, pages 306 & 307 mentions Oren GRIMES. Click here to read the text. 2 mo's. & 2 d'ys.